I can’t afford to be so naïve so as to dismiss the young faces around me. Their energetic flair, gusto for knowledge, thirst for adventure, and quest for an endless love, remind me that not too long ago was the time when I realized my dream and its quantitative derivatives were becoming more tangible. They teach me a few things that push me harder, only to get better. They make me think constantly about the rapidly changing world, and never let me forget about the years that have passed. Perhaps, they are half of the reason why, believe it or not, the old ones’ way is less obscure. I am still young and probably have the mien to prove it, sans the fine lines on my forehead, bags under my eyes, and tummy unwittingly sticking out. I am saying this out loud that I am a proud twenty-something, though I am nearing off the calendar. I am proud to be in this bracket. But I have already started counting the expiration of my so-called youthful years, and yes, I am endangered to be part of the old population, soon, panicking not nonetheless (trying to sound calm). If going 30 is jumping off the fence, then I am definitely old. But, I plead to make the numbers game higher. Forty or 50, perhaps? In my opinion, either is reasonably old. Now I know the perception of being old also grows as we age. In our neighbourhood, oftentimes, I see a group of, say, senior citizens sitting around, immersed in a less modulated conversation I couldn’t fathom because of the language, and, more importantly, enjoying the morning sun. They are a bunch I have always wanted to ask what it is like being old. Their perspective would be a bright answer for someone who is potentially old. So many questions, I just need to ask. What it is like being that old lady at a mall who struggles to text her husband to pick her up? 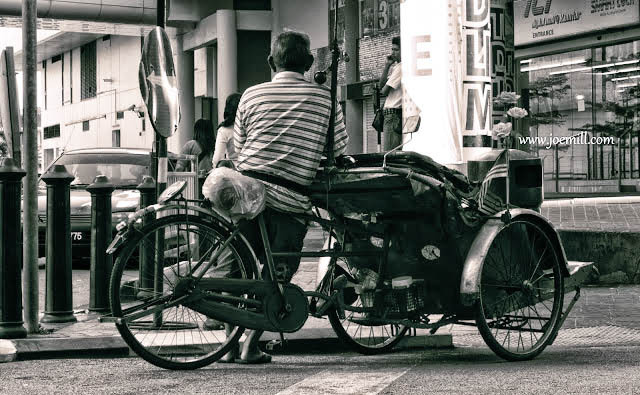 What it is like being a part of that joyous old men’s club at a hawker centre? What it is like silently standing on a long queue for more than an hour at a bank one fine Saturday, where half are the same as your age and being amused by that vibrant, bejewelled, chatty lady? What it is like selling tissues on a wheelchair or a seeming sleeping mat, when you should’ve been resting comfortably at home already? What it is like working as a waitress or checkout lady, when your age doesn’t merit you to? What it is like joining a club doing rounds of morning and evening exercises? What it is like working as a calloused trike driver? What does it feel like when the able doesn’t give up his/her seat inside the train? What does it feel like being sent by your only child to a nursing home? Is there anything else you want to achieve in life? How come you’re so successful? Some answers might be hard to imagine, while some would easily make perfect sense, but one thing remains true, the old people are living proof of a time existing in two dimensions -- a time wasted and a time well-spent. Perhaps, they are half of the reason why the young ones’ way is less obscure. They should be. Wondering about paragraph 2 sentence 1..? The tummy thing specifically. hahaha. kidding. What struck me most is this: "a time wasted and a time well-spent'. I wish I could always have the latter..